More classrooms are opening their doors to student discussion online through online collaborative projects, online courses, and blended learning. They are doing this through public social media like Facebook as well as private social media tools like Edmodo, My Big Campus, and Moodle. Whatever your school policy is—whether completely open or using the “walled garden” approach—there are general rules to follow when promoting meaningful online discussions. Here are 10 rules of thumb to get you started. 1. Keep discussions to Bloom’s higher level topics, including creating, evaluating, and synthesizing. 2. Use discussion as a formative assessment for checking both individual and group understanding. This does not mean it always has to be graded for accuracy, but more as a way for the teacher to plan. These questions may be lower on Bloom’s Scale to show remembering and understanding. 3. A discussion can be graded, although it may be best to grade for participation. For example, the teacher may post and then ask students to reply to this post with a defined number of sentences. Students could also be evaluated on their comments on other student posts. Be specific on the grading criteria. ■ All students must use proper English grammar and spelling. ■ All students must use complete sentences. ■ All students must not use text lingo (e.g., LOL). ■ All references that have been copied and pasted should be cited by name with a link to the source. ■ The conversation should stay on topic. No outside or sidebar conversations. ■ Thoughts and ideas should be concise and to the point (i.e., do not ramble). ■ Keep statements specific and reasoned (i.e., avoid yearbook-type comments). ■ Exercise proper digital citizenship (see below). ■ All students will show respect and understanding for the diversity of other participants. ■ All comments should be academic in nature. ■ Do not use personal identifying information. ■ No plagiarizing. Always give the proper credit. ■ Be sensitive to the fact that your words stand alone without the benefit of expression and tone found in face-to-face communication. ■ Understand that posts are permanent, and viewable by all participants. 6. Vary the media used in discussions. Use documents, PDF files, movies, music, sound files, Power Points, Web site links, and images to promote the standards and concepts. 7. Keep on topic. Try to provide discussions that will support the standards and 21st-century competencies that you wish to emphasize and that will be assessed. 9. Be sure to model by practicing what is required while also commenting on what students write. Michael Gorman oversees one-to-one laptop programs and digital professional development for Southwest Allen County Schools near Fort Wayne, Indiana. Read more at 21centuryedtech.wordpress.com. For teens, Common Sense Media offers five simple rules of digital citizenship to help them create a world they can be proud of—and inspire others to do the same. Think before you post or text. A bad reputation could be just a click away. Before you press the “send” button, imagine the last person in the world that you’d want seeing what you post. What goes around comes around. If you want your privacy respected, respect others’ privacy. Posting an embarrassing photo or forwarding a friend’s private text without asking can cause unintended hurt or damage to others. Give and get credit. We’re all proud of what we create. Illegal downloading, digital cheating, and cutting and pasting other people’s stuff may be easy, but that doesn’t make it right. You have the responsibility to respect other people’s creative work—and the right to have your own work respected. Read more tips on digital citizenship at www.commonsensemedia.org. The Victory Lakes Intermediate School in League City, TX, conducted a oneyear pilot during the 2012-2013 school year to test the waters for a Fall 2013 district-wide 1:1 roll-out. Language Arts teacher Emily Auffarber was one of the pioneers of this 1:1 pilot, and worked with her 8th grade students to create a digital citizenship code of conduct. At Cedar Hill ISD in Texas, coaches know the influence that a positive—or negative— digital presence can have on recruitment opportunities for students. That doesn’t mean social media is banned at Cedar Hill. Instead, as part of their BYOD initiative, they train students on good digital citizenship with the goal of using the resulting digital footprints to open doors to college and careers. “We teach students that their digital footprint will be much more powerful than any resume they can write,” says Cedar Hill’s executive director of technology, Kyle Berger. Berger has seen colleges become “social media investigators,” increasingly relying on digital data when deciding who gets those letters of acceptance. He sees many recruiters requesting to “friend” student scholarship prospects. 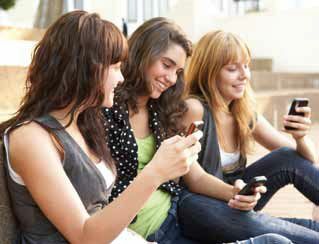 Once friends, the recruiter has access to the student’s digital history. These investigations go beyond Facebook, and include other popular sites like Twitter and Instagram. Berger says student athletes can start to build their digital profiles and use them to their advantage with recruiters. Students can tweet about just finishing that workout or getting ready for the big game. They can post about setting a new goal and achieving it. He recommends their messages extend to positive classroom goals and experiences, too. Berger also believes employers are increasingly conducting digital background checks on applicants before entrusting them with jobs, so the same guidelines used by athletes can be used by any student to open doors to jobs and colleges.